The December 2014 Transition Network newsletter Is this email not displaying correctly? While our theme in November was catching up, December’s theme is ‘Less is More’. In the newsletter we find out about the new Support Framework, we want to hear your starting out stories and your thoughts on Transition Culture. We offer several reflections on stuff and what happens when we don’t have so much of it. Plus news from initiatives including the Round up; Training courses coming up and Book reviews. And since it’s that time of year – we have our plan for a Christmas advert! Details and application form will follow shortly. Are we doing Transition Culture right? It’s now 17 months since Transition Culture moved to its home at transitionnetwork.org. We have introduced a number of changes, in particular the monthly themes, the monthly Transitioner’s Digest and the bigger editorial ‘think piece’ at the start of each month. As we reach the end of 2014, we’d like to hear how you are finding it, what you like, what you think could be changed, any suggestions and feedback. We have created a very quick survey that should only take you a minute or two, and your feedback will be very valuable in shaping what we do during 2015. Please let us know what you think by Sunday the 14th of December. Wanted: your stories of starting your Transition initiative. Rob Hopkins puts on Transition glasses and has a look at the various Christmas adverts being put out by the UK stores. He then has a go at suggesting what a Transition Christmas ad might look like. It is all too easy to imagine that prior to present-day consumption levels life was bereft of pleasure, fun, anything rewarding. As a way of challenging that Rob Hopkins shares a conversation he had with 99 year old Douglas Matthews. One of the tasks that loom large as we strive to build more resilient, sustainable communities with a new paradign writes Sherry Ackerman, is reassigning value to the subjective and intrinsic experiences in life. We can begin to do this on our own, thus setting precedents for employers, teachers, government and others. We can do things that bring us pleasure — instead of just money or “stuff” — as a part of our regular routines. Around the UK from Bath, Bristol, Cardiff, Crystal Palace, Harborough, Haverfordwest, Marlow, St Albans, Stirling, Stroud, Tooting, Totnes, Wivenhoe. In Germany from Bielefeld, Essen, Wiesbaden, Witzenhausen and Würzburg. Budapest in Hungary, Réseau in Belgium, Bologna in Italy and South Carolina in the USA. Plus Montreal, Perth, and Winnipeg in Canada. Ian Jackson from Transition Belper tells an ongoing tale of engagment with the planning process. 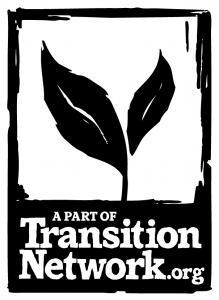 The world’s first Permaculture for Transition course takes place in the new year. Launch online begins again January 13th, 2015 at the new time of 09.00- 10.30 UK time. This will enable people in Asia and Australia and New Zealand to take part more easily. There is a talk training in French, and a few places are still left for the Inner Transition training in London this weekend. Over the last year ‘Monitoring and Evaluation for Sustainable Communities’ has developed a set of evaluation tools. They are easy to use, tailored to your needs, abilities, and time, and offer ways to evaluate your projects or your Transition initiative. It is a powerful, deeply felt, painstakingly-researched book which takes the reader on an incredible journey and makes a radical yet common-sense case. So why is it that by the end Rob Hopkins felt underwhelmed? Incredible! : Plant Veg, Grow a Revolution is the story of Incredible Edible Todmorden (IET), the food-growing project in Yorkshire which has inspired people around the world to look at their urban spaces in a very different way.